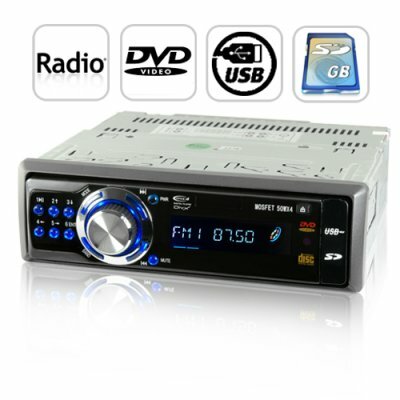 Successfully Added Car CD DVD Player 1-DIN - Music and Movie Entertainment to your Shopping Cart. 1-DIN car CD/DVD player, the perfect item to transform your normal dashboard CD player into an amazing digital media center. With support for a wide range of discs and file formats, you'll never run out of songs to listen to. With an incredible 45W x 4 audio output, simply insert an SD card or connect a USB flash drive into this unit and listen directly to your favorite songs from the car's speakers. When you're in the mood for something different, listen to the radio with the AM/FM radio tuner or slide your friend's music CD into the high quality CD player. For your video needs, this car CD/DVD player comes with an AV OUT slot for connection to any size LCD screen. With no pre-installed screen, you have the freedom to choose your own monitor that is both the perfect size and the perfect price. Connect it to your favorite LCD monitor to have a complete music and movie entertainment system. You have the option of installing the monitor wherever you want. Go ahead and buy a monitor and install it behind the driver's area, giving everyone a safer, more enjoyable ride (especially the kids!). Functionality, flexibility, and great value make this product great for car owners who wants to enjoy their media files in their vehicles as well as resellers looking for a hot new item. Order a sample now, then order in bulk to enjoy even greater savings. Brought to you at an unbeatable price by the leader in factory-direct electronics: Chinavasion. Just load your files on to a USB stick or an SD memory card and plug it into the appropriate slot on the front of the device. Then press mode to switch to USB mode.